Welcome to the Auburn & Worcester Youth Lacrosse website. We are the home of lacrosse for girls and boys, grades 1st through 8th, in the Auburn and Worcester area. We are an organization that believes youth sports should focus on developing young players to be the best that he or she can be. We focus on developing a player's skill, sportsmanship, teamwork and love of the game. We, the coaches, will never berate an athlete or another coach or referee. We expect the same kind of attitude and behavior from our players. We play hard but we play clean and with respect for those around us. We hope your young athlete will consider joining us. We promise to teach your child what he/she needs to know in order to play this game competitively. We also promise to provide an environment which is positive and encouraging to help your child play the best that he/she is capable of playing. Here is the practice schedule for the 2019 season. We will contact you when practices will actually start. Fingers crossed for no more snow!!! Once the season starts, contact your coaches directly if there are questions about practice cancelling or any other issues. Facebook and the website are not suggested because not all coaches have access to them. All games will be on Sunday, but times will vary depending on if we are at home or away. When it is finalized I will upload it to the website. Boys games start March 31. Girls games start April 7th. Q: When does the season start? Q: When does registration open? Q: I may be interested in coaching, how do I get started? A: We are always looking for helpful parents to either help at practice or, ideally, become coaches. There are certification requirements for both the girls and boys programs. Please reach out to us and let us know if you are interested. You don't need to have played before in order to coach. It is helpful, but we have coaches in the program that have played that can help out. There are also great online resources to help learn. The certification clinics are also very helpful. The biggest thing we look for is somebody who can teach the kids and make it enjoyable. Have good energy and care about teaching the kids, and we can help you learn the game. A: In the registration process you are required to go to US Lacrosse and create and pay for a membership, and then it will bring you back to the AYL website. US Lacrosse will give you an ID number to enter on our site. There is often on issue doing so on IOS based devices (iPads, iPhones). Make sure all information is entered the same on each website; birthdate, email, address, grade, etc. A: You need to go to the MBYLL web site and register your player. You will create a profile for yourself, add your child, then register them for the spring 2019 season. You pay $35 there and will be sent a code via email. It will also be available on your son's MBYLL profile page. The $35 covers insurance for the year and the portion of the league fees the AWYL pay directly to the MBYLL. The money will go back into the regions for trainings, coach education and other lacrosse based events. (US Lacrosse membership is no longer required for boys program). Make sure all information is entered the same on each website; birthdate, email, address, grade, etc. Q: Why is the process to register my son and my daughter different? Q: How often do you practice? A: U9s practice one day a week (last 3 years on Saturday mornings), they also play on Sunday. A second practice day may be available at the coach's discretion. We have done this the last couple seasons to help out kids that play multiple sports. A: The town based teams do NOT require tryouts, we welcome all players, new or returning, as long as there is space. A: SOME years we have enough kids to add a "select team" for additional games and practice, those teams will require a tryout. Q: How much does it cost for the season? Q: Do you offer any equipment to borrow? A: Yes!!!! We have some used equipment to loan for the season for the older kids. As of the 2019 season, we applied for and received the First Stick Program from US Lacrosse. With this program, we will receive 20 sets of lacrosse gear for 1st-3rd graders. As part of the program, these sets of equipment are to be loaned for the season, then returned to us. These sets are not for sale. They are strictly loaners for the season. If you aare in 4th grade or above and in need of borrowing equipment, reach out to us and we will do our best to provide you with the needed equipment. Also, check out websites such as www.sportstop.com, www.laxsteals.com, www.lacrossemonkey.com, www.lacrosseunlimited.com, and www.lax.com. You can also check out Kleen and Hard, which is located on James St in Worcester. Be sure to mention that we sent you. They have both new and used equipment. Q: Where does the AWYL practice? A: Over the past several seasons we have used Lemansky and Swanson Rd Intermediate School for practice and Auburn High School for games. A: Boys need a lacrosse helmet, shoulder pads, arm pads, gloves and a lacrosse stick. You can find starter packages for around $150-$200. Check out websites such as www.sportstop.com, www.laxsteals.com, www.lacrossemonkey.com, www.lacrosseunlimited.com, and www.lax.com. You can also check out Kleen and Hard, which is located on James St in Worcester. Be sure to mention that we sent you. They have both new and used equipment. A: Girls need goggles, mouthpiece, and lacrosse stick (girls have different sticks than boys). Check out websites such as www.sportstop.com, www.laxsteals.com, www.lacrossemonkey.com, www.lacrosseunlimited.com, and www.lax.com. You can also check out Kleen and Hard, which is located on James St in Worcester. Be sure to mention that we sent you. They have both new and used equipment. Q: What towns can play for the Auburn & Worcester Youth Lacrosse organization? A: The AWYL represents both Auburn and Worcester, but we allow players from surrounding towns that do not have their own lacrosse program. Q: What league does the AWYL play in? A: The AWYL plays in the MBYLL and MBGLL, “town lacrosse” or classic. There are programs all over Massachusetts that are part of the MBYLL and MBGLL. Q: Who runs and coaches the AWYL? A: The AWYL are a nonprofit, all volunteer organization. We have volunteers that run the program as part of our Board. The coaches are all parent volunteers like you. Most have never played lacrosse. Q: If your coaches didn’t grow up playing how do they learn to coach? A: The MBYLL/MBGLL and US Lacrosse sponsor a coach training program. There are required on-line and in-person trainings. There are experienced coaches in the program always willing to help out or answer any questions you have. Q: What do you pay coaches or do they get discounts on signing up their children? Q: If is a spring sport why do we register in the fall? A: We are required to submit how many teams at each age group we will have by 12/31 to the league. We also place our uniform order by 11/1 to keep the uniform costs as low as possible. Knowing the number of players and teams also helps us figure out number of coaches needed, practice and game times, and practice and game locations. Q: Can we sign up now and pay later? A: Yes!!!! We ask that people register ASAP to help us prepare for the upcoming season. However, we allow you to defer your payment to February. We understand that the holidays cost a lot and we try to help out with that. However, please register as soon as possible to help us prepare for the season as much as possible. Q: Is there a family max or discount? A: Yes!!!! The second sibling gets a $20 discount, the third gets $30, and the fourth gets $40. If you have more than 4 kids in the program, we will extend further discounts. Q: What is the refund policy for the Auburn Youth Lacrosse? A: The AYL can NOT refund any funds paid to US Lacrosse or MBYLL/MBGLL. Prior to Feb 1 the AYL will refund all money paid to the AYL for registration only. After Feb 1 the AYL will refund 50% of the fees paid to the AYL for registration. Exception being if we have a player waiting to take the slot of the player leaving. We incur 75% of the cost for the season prior to 2/1 which is why we can only offer the 50% refund. 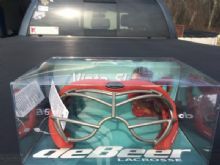 deBeers girl’s lacrosse goggles. These are the ones that sell in Dicks and other stores for $40. THIS IS OUR LAST PAIR!!! Anyone who may be interested in a coaching position for the upcoming 2019 spring lacrosse season can submit an inquiry to lax@banditsyouthlacrosse.com. All potential coaches or volunteers will need to be CORI cleared before being considered for a positions.